Perth Round 2: Now with Quokkas! We came back to Perth mainly because it was the middle of February and we wanted to be in a big city for Valentine’s Day and Chinese New Year. Since we had stayed in the CBD last time, this time we opted for a place out in the suburbs, closer to Fremantle. 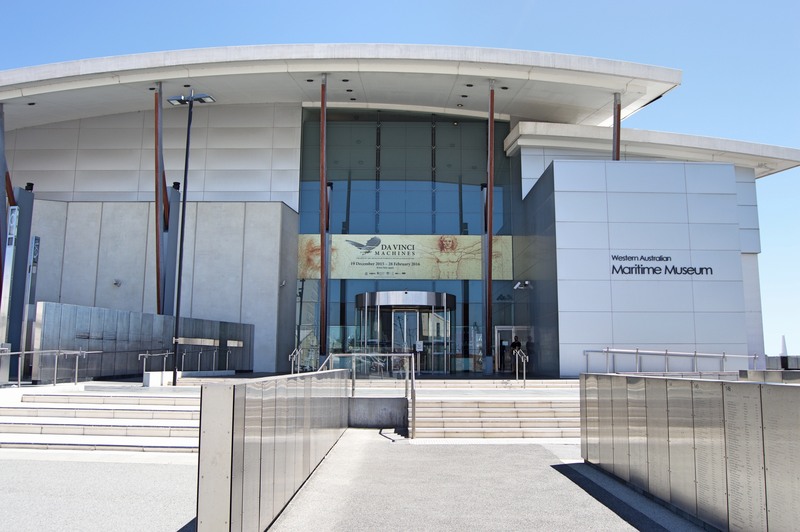 We wandered into the Western Australia Maritime Museum one day while in the Fremantle area. Because the universe hates Chris, the submarine was closed for the day due to the heat wave hitting Perth at the moment (we also missed going in the submarine in Sydney because it was under renovations). We looked at some cool DaVinci Machines and a lot of different boats. This is also where we learned that the Australian boxing kangaroo symbol comes from the famous Australia II, the first Australian yacht to ever win the America’s Cup and the first non-American yacht to win it in 132 years. They created the mascot because the British ship had a smoking bulldog and they wanted something cool too. 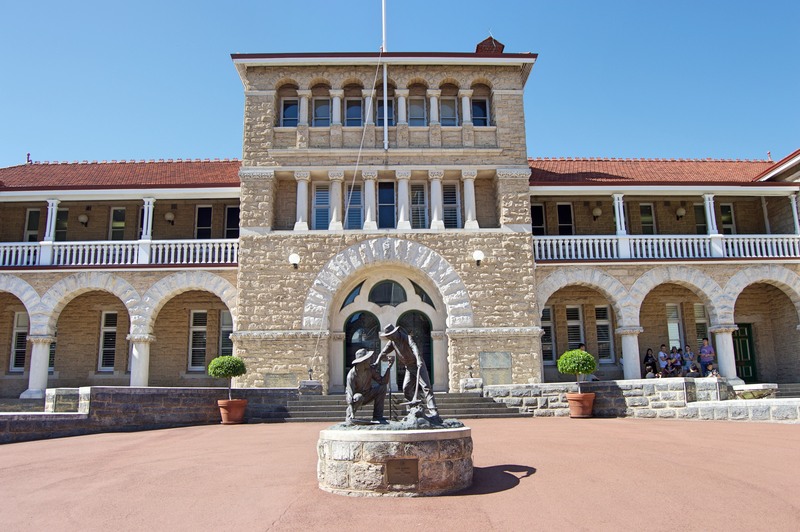 We decided to check out the Perth Mint because Chris had never been to a mint before and also because it was air-conditioned. The mint was originally set up in order to mint coins from all the gold being collected in the nearby gold fields. Now it doesn’t mint any actual currency anymore but instead focuses exclusively on collectible gold pieces. There were a million different collectibles detailing Bruce Lee, the year of the monkey, etc., so you can tell who their target market is! 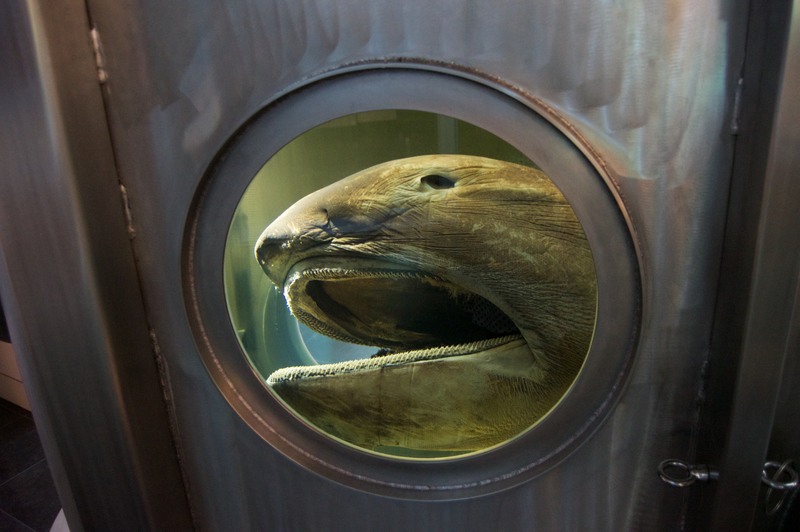 They also have a 1 tonne (!!!) gold coin there. Chris had recently read that the Canadian government had sold off a bunch of their gold reserves so this one coin was actually more gold that the Canadian government owned at the time. The coin rotates in this sweet display holder which also doubles as a super secure vault that it retracts into at night. Very Mission Impossible. There is also a small display where you can reach in and lift a gold bar. We soon learned that I could not be a very good gold thief because I couldn’t lift it. We also watched a demonstration where they pour a gold bar. Apparently they have been using the same gold bar for the entire time they have been doing it (i.e. 16 years or something), they just keep melting it down. While we briefly considered if we could grab the bar and run out before we were caught we decided against it because there were several large security guards around. We unfortunately have no pictures from inside the mint because that is not allowed due to security reasons. 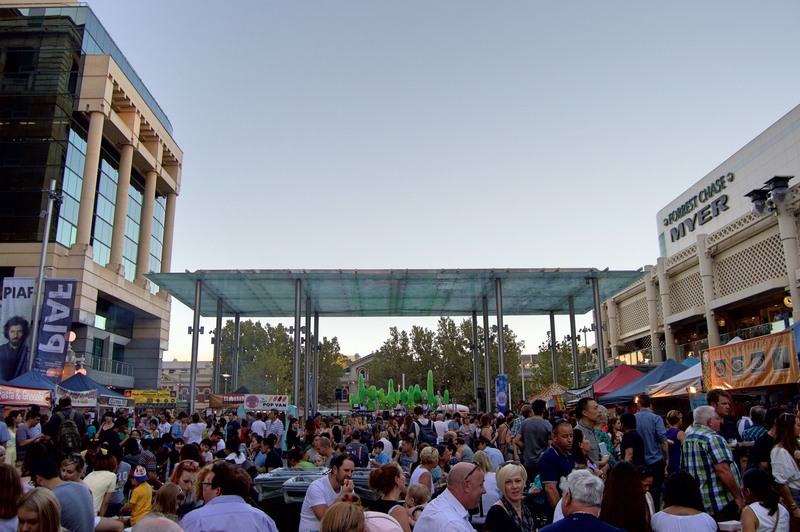 On Fridays in Perth there is a big food stall market in the CBD, complete with live music and such. 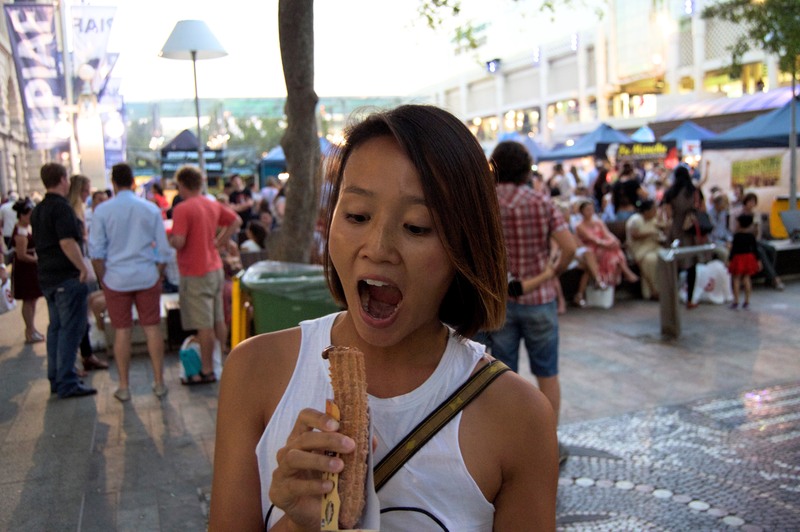 We had some churros and spicy Korean food and listened to latin music. 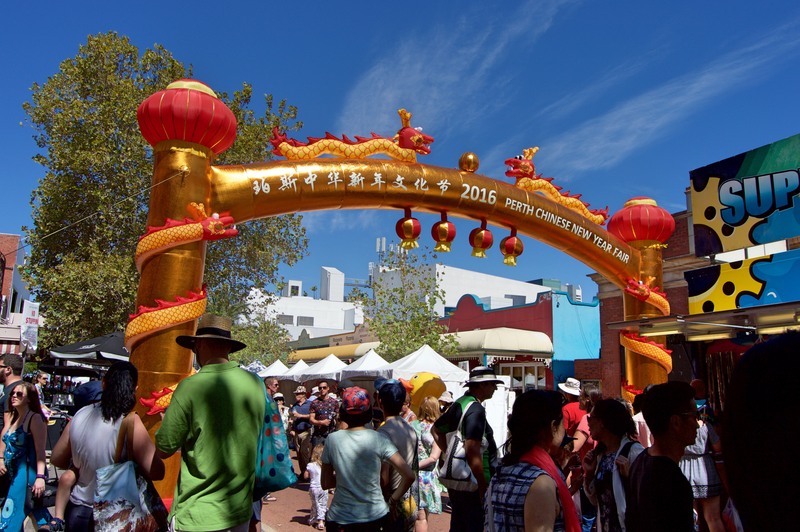 The Lunar New Year happened while we were in town, so on the weekend there was a fair in Chinatown. We went to grab some dim sum and bubble tea obviously, but also to see the lion dances and such. 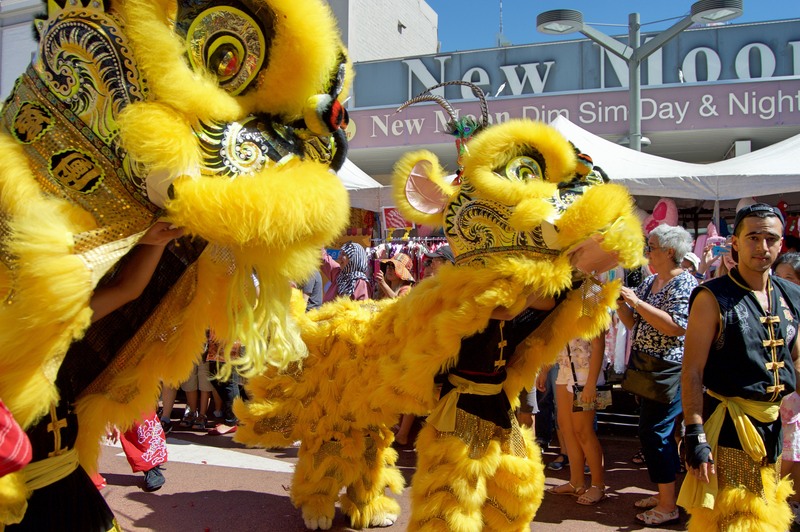 There is a sizeable Asian population in Perth so it was a pretty big affair. We had a bit of a debate over whether to go to Rottnest Island as Chris thought it was too expensive (once you factor in the ferry ticket, admission fee, and bike rental, it’s about $100 a person). 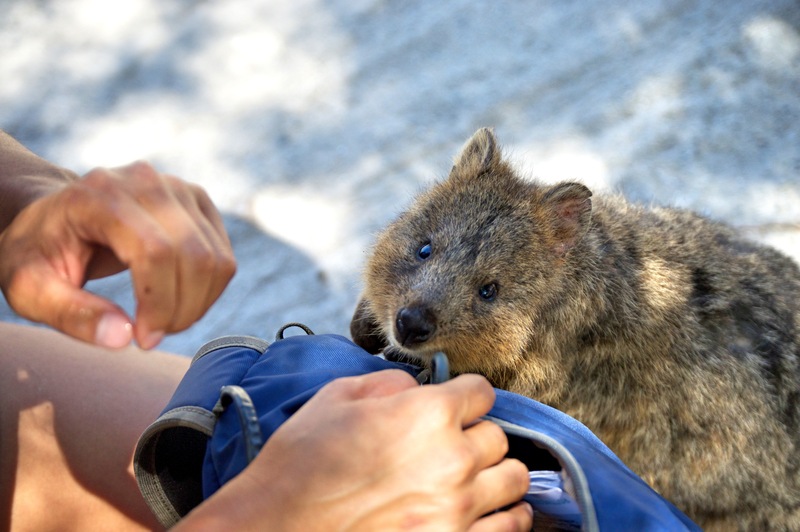 I won out though because I HAD TO see the quokkas. 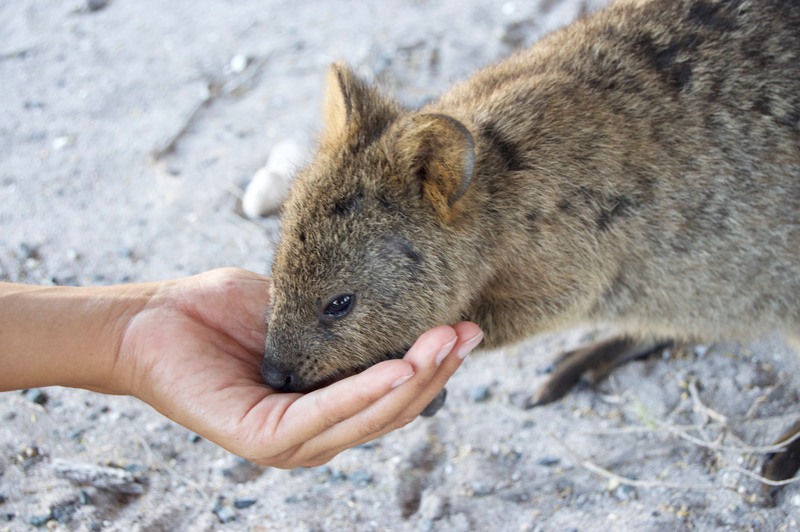 Quokkas are a super cute little animal that are in abundance on the island because of the lack of predators. They look a little like fat rats which is why the Dutch explorers gave the island its name. 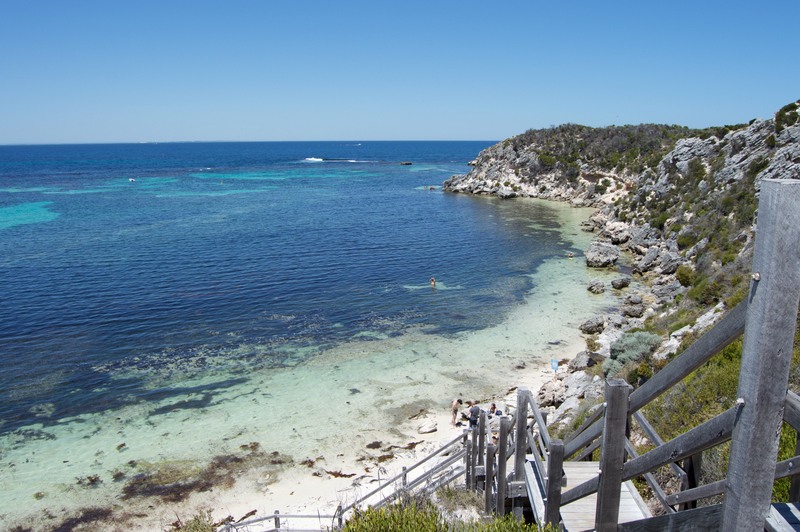 Rottnest Island is about a 45 minute ferry ride from Fremantle. The island itself is about 10km across and virtually car free except for a few staff vehicles and the shuttle bus that takes tourists to different parts of the island. There is a little village with shops and such at the ferry terminal, as well as some other hotels scattered around the island. 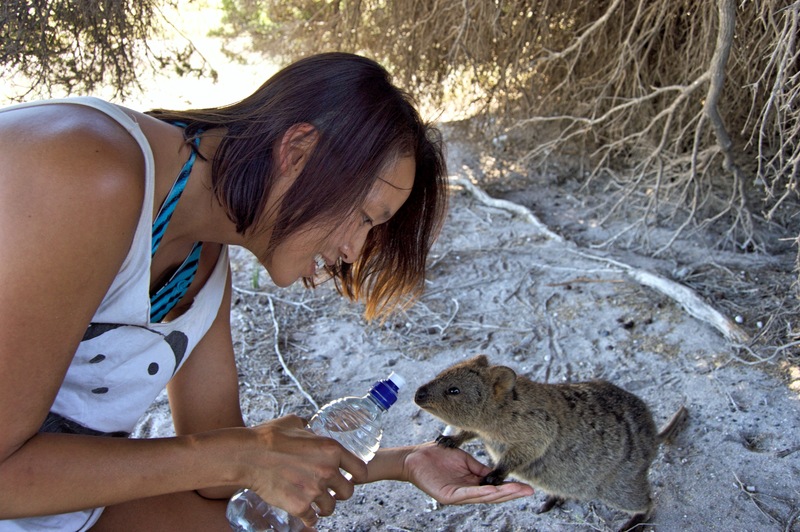 Little quokka would like some water. The two options for getting around are to either take the bus, or bike. Since we’re young and fit(-ish) we went with the bike option since it’s more flexible. Of course what they fail to tell you when renting a bike is that Rottnest Island is not exactly flat. We got quite the workout pedalling from one end to the other. Biking around the island takes you past various beaches, as well as a lighthouse and some lookout points. We made several stops to look at quokkas meandering around in the bushes. You aren’t supposed to feed them (although we saw numerous tourists disobeying this rule) but our AirBnB hosts told us that they will drink water out of your hands. So we did that instead, and it was pretty exciting. They are very cute! Quokkas are unofficially known as the “happiest animal in the world” because their little faces tend to look like they are smiling. 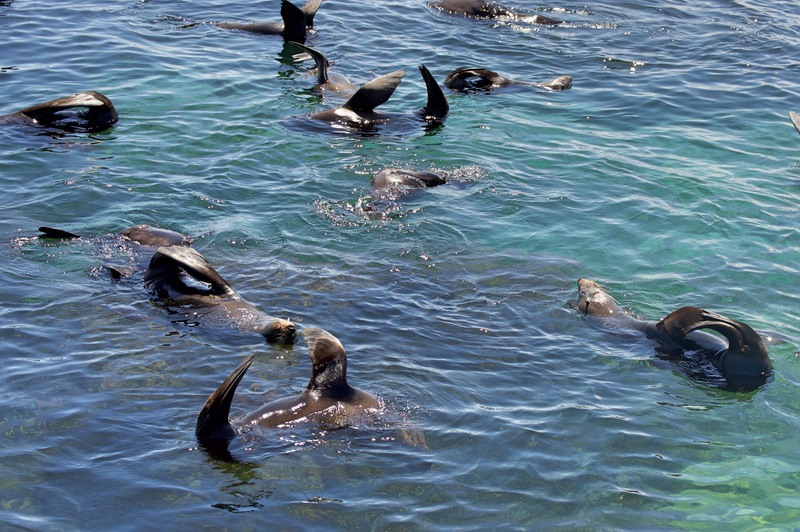 At the farthest tip of the island there is a colony of New Zealand fur seals that live there. If you can scramble down the rocks without killing yourself you can jump in the water with them, so I decided to check it out. 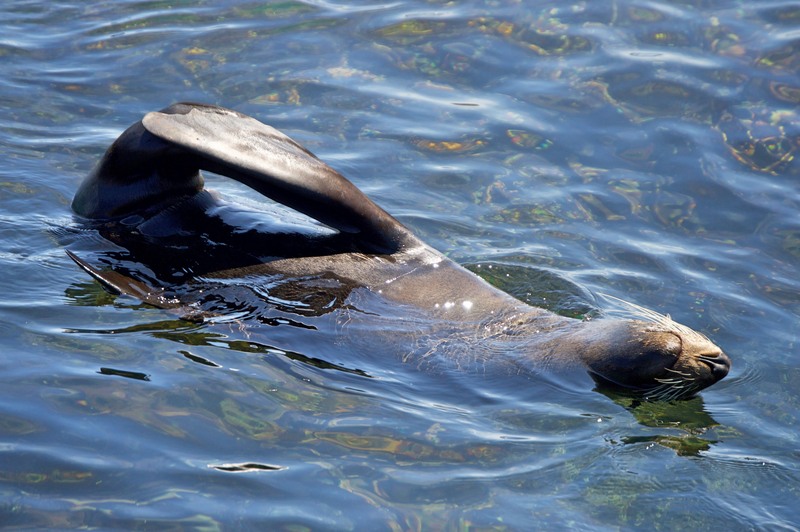 Unlike the sea lions these seals are pretty lazy and mostly just float in the water napping. It’s pretty funny to see them resting though because they all just kind of lie upside down in the water with their flippers sticking out. We made it back to the ferry terminal unscathed but in desperate need of hydration. Good thing there was a slushie machine there. Once we were back from Rottnest Island, it was time to pack up and get ready for the long drive to the other side of Australia!